RECIPE TITLE "Basic Pasta Dough"
1. In a food processor fitted with the steel blade, combine the flour, egg yolks, salt, olive oil, and 2 tbls of the water. Process until the dough begins to hold together, then stop the machine and pinch the dough to test it. If it is too dry, add up to 1 more tbls of water and process until it forms a moist ball. Turn out onto a lightly floured smooth work surface and knead by hand, until a smooth ball is formed. Loosely wrap in plastic wrap and let rest at room temperature for 30 minutes to 1 hour. 2. Cut the dough into 4 equal pieces. Keep the other pieces covered in plastic while you roll out one piece at a time, by hand with a rolling pin or through the rollers of a pasta machine, stretching the dough to the desired thickness. 4. Adjust the cutting mechanism to the desired width, cut the noodles, and allow them to dry before cooking. A convenient way to dry pasta is to arrange the cut pasta on a pastry tray sprinkled with flour, preferably semolina flour. As one layer is completed, sprinkle flour over the noodles, place a piece of parchment paper over them, and continue layering with noodles and flour. Dry for at least 15 to 20 minutes. 5. Repeat with the remaining pieces of dough. 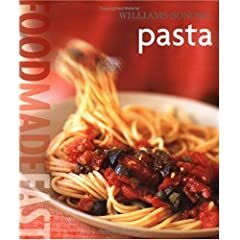 The book is arranged in four sections, exploring first dried semolina pasta, then fresh Italian-style pasta, Mediterranean pasta and European dumplings, and finally, Asian noodles. There are thirteen chapters devoted to sauces alone, and recipes are included with the type of pasta with which they work best -- from the simplest to the complex, but all within reach of the home cook. 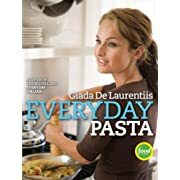 As a bonus, the book includes excellent photographs of the various pasta and noodle shapes, and impeccable illustrations clearly depict each step of key techniques. Special sections are devoted to such specific topics as "Are Electric Pasta Machines Worth the Money?" and "A Guide to Popular Cheeses."